A screwed up sleep schedule can be very helpful when you’ve a project that’s poking at your ribs saying HELLLOOOOOO .. work on me!!! So I followed my instinct and worked on it LOL .. I got it to the point where I was starting to see something and I just couldn’t help myself .. I kept going! 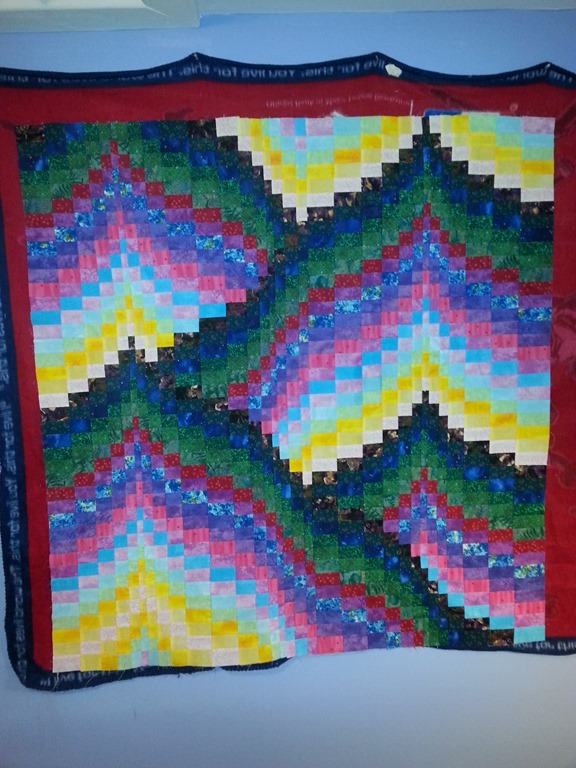 I was seeing mountains here .. no more pixies or faeries which is a real shame because I really did like the idea of tying that in .. At this point I was thinking fire mountain … sunrise in a deep valley .. with a twist because that twist is really showing with my first narrow strip. The whole while I was working on it, that was buzzing in the back of my brain along with borders .. It went together really quick once I got a rhythm going – I didn’t even notice the time after a bit .. Just kept working in sections and putting up strip after strip – I kept eye balling the stack of fabric that wasn’t going to be used. 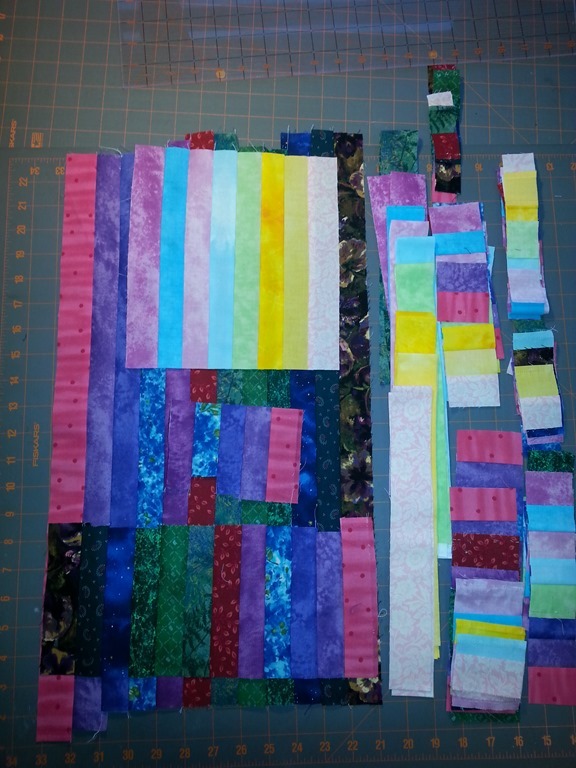 I didn’t have to much left over of the strips that I put together before I started – it was the bits I had to take apart to make variations in the pattern. Borders I was thinking .. borders .. borders .. borders .. and I’m still thinking borders LOL .. I’ve a few ideas, but pretty sure they aren’t going to work . nothing has totally bit me on the nose and hey . try this LOL. I am pleased with how it’s turned out so far. 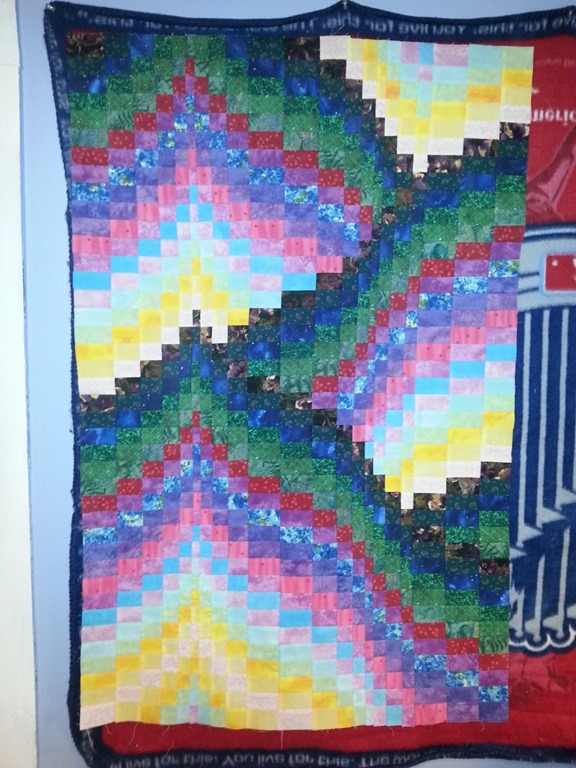 I just have to figure out borders then quilting. Today I get my swap partner for the candle mat swap – I’m so looking forward to that – the pattern looks fun as hell!